Instant Pot Baked Beans cook up in an hour with your pressure cooker. Sweet, sticky and delicious, you will never buy canned beans again. We’ve all had the Better Homes and Gardens Baked Beans at one time or another, right? If you’ve been following my blog, you will know that I can never leave good enough alone. I always like to take recipes up a notch. This Instant Pot Baked Beans recipe makes a big pot of beans and easily feeds at least 10 people. This Instant Pot Baked Beans recipe will have you jumping for joy! You can make these delicious Instant Pot Baked Beans right in your Instant Pot, Mealthy MultiPot or Pressure Cooker, without an overnight soak and without hours in the oven! Canned baked beans, in my opinion, are usually too sweet. While the BHG Baked Beans are pretty good, I felt like there was something missing and I felt they were a bit cloying. A few changes and additions and I came up with the most delicious Instant Pot Baked Beans recipe ever! BACON!!!!! – because, heck yeah! Real Maple Syrup – make sure to use Real Maple Syrup and not the fake stuff like Log Cabin or Mrs. Butterworth’s. 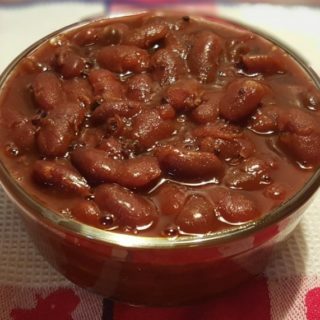 Molasses – adds a wonderful depth of flavor give these Instant Pot Baked Beans, the delicious “sticky” texture, that everyone loves. 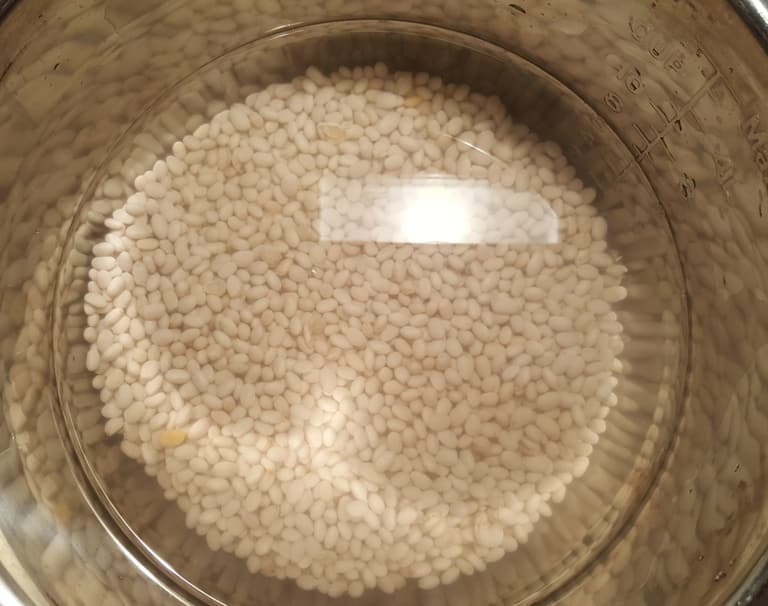 Do I Need to Soak Beans Before Pressure Cooking? You don’t need to soak your Navy Beans overnight, if you don’t want to do so. The Instant Pot, Mealthy MultiPot or Pressure Cooker will easily soften the Navy Beans. You can always just set the cook time longer, if you do not want to soak your beans. I only do it to remove any dirt and check for debris. If you do want to soak the beans, this Salbree Steamer Basket makes things easier. After popping off the handles, I can use it in all my Instant Pot, Mealthy MultiPot or Pressure Cooker. So add the beans to the strainer and rinse off, removing any rocks or any debris. Cover the Navy Beans with water, about two inches above beans. Why Are My Beans Hard? If beans are old, they won’t soften up during a regular cook cycle. In fact, they many not soften up at all. Make sure to check the date on your package of beans. A concern however, is that if the package of beans shows a good date, it is possible they were not package right away and could still be old. If making my Instant Pot Baked Beans and your beans are hard and there is excessive liquid, it is most likely due to old beans. Hard beans won’t absorb the liquid properly. 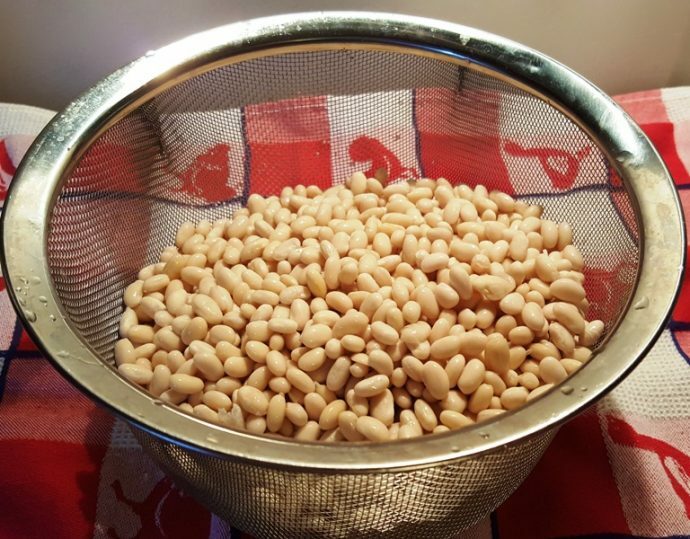 Pull the basket of Navy Beans from the pot of water and rinse Navy Beans again, getting rid of any debris. 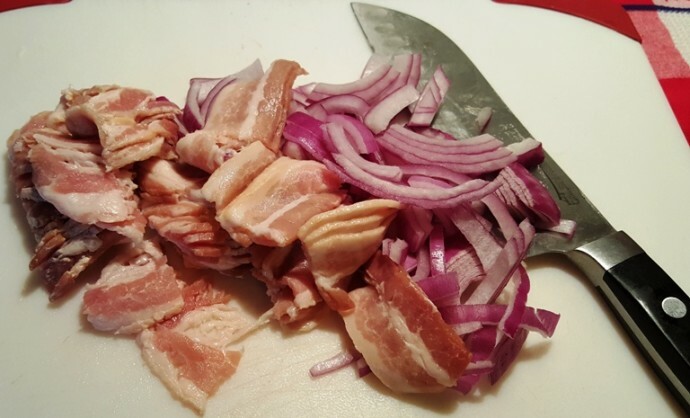 Use a Sharp Knife and rough chop the bacon and onions. The Onions will mostly disintegrate during cooking. The Bacon will shrink up a lot, so rough chopping will ensure some decent size bits. It is always important to allow your Instant Pot, Mealthy MultiPot or Pressure Cooker cooking pot to fully heat. This helps make a stainless steel cooking pot, non-stick! A little Sauté of the Onions in the Bacon Grease will add lots of flavor. Make sure to use a Spatula, so that thing don’t start to stick. If necessary, add a little water to the cooking pot while rendering the Bacon. The onions should only start to soften. Add the rest of the ingredients into the Instant Pot, Mealthy MultiPot or Pressure Cooker. 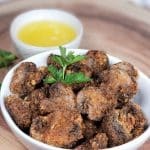 The secret ingredient takes these babies up a notch! Don’t concern yourself with the amount of liquid in the Instant Pot, Mealthy MultiPot or Pressure Cooker cooking pot. A certain amount is needed for the pot to come to pressure and then cook. Also, assuming the beans are fresh, they will continue to absorb more liquid after they are cooked. If the beans are old, they won’t soften and won’t absorb the liquid. You can always simmer, if you feel the beans are too watery. Personally, I like my Instant Pot Pressure Cooker Baked Beans a bit liquidy, as I dip my Homemade Hot Dog Bun into the sauce, before taking a bite! These Instant Pot Baked Beans will taste like they have been cooking and baking all day in a clay oven. Don’t they look delicious!!!???!! Big ole pot of beans. Why Do You Add Salt to Beans After Cooking? Salting before cooking can sometimes makes the skin of the beans rather tough. This can be a reason beans sometimes take longer to cook. Perfect to Freeze for Hot Dog Night! 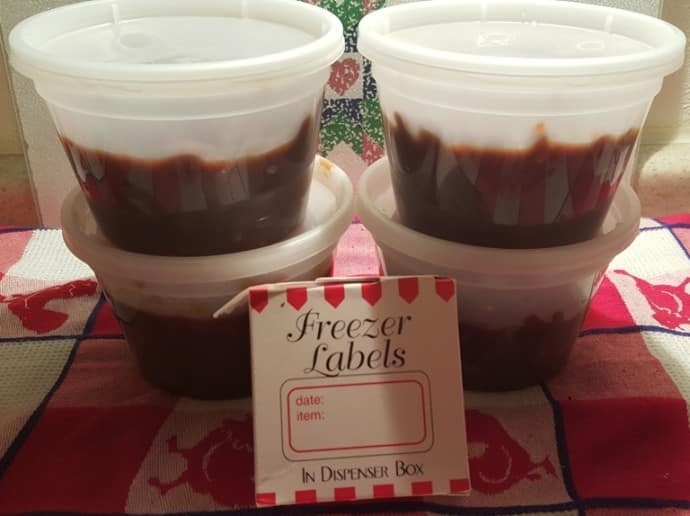 How Do you Store Instant Pot Baked Beans? Beans freeze really well, so I always use at least 16 ounces of dry beans. They freeze well in Reditainer Extreme Freezer Containers. These labels are great, so that I know what’s in the container. When you are in the mood for Instant Pot Baked Beans, like on Hot Dog Night, pull a container from the freezer. They easily reheat in the Instant Pot, Mealthy MultiPot or Pressure Cooker. 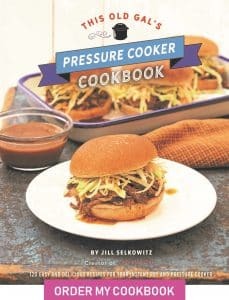 Try my Pressure Cooker New York Dirty Water Hot Dogs recipe, the next time you make Hot Dogs. 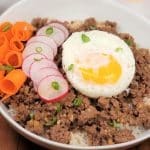 It’s a super easy 3 ingredient dump and forget method. 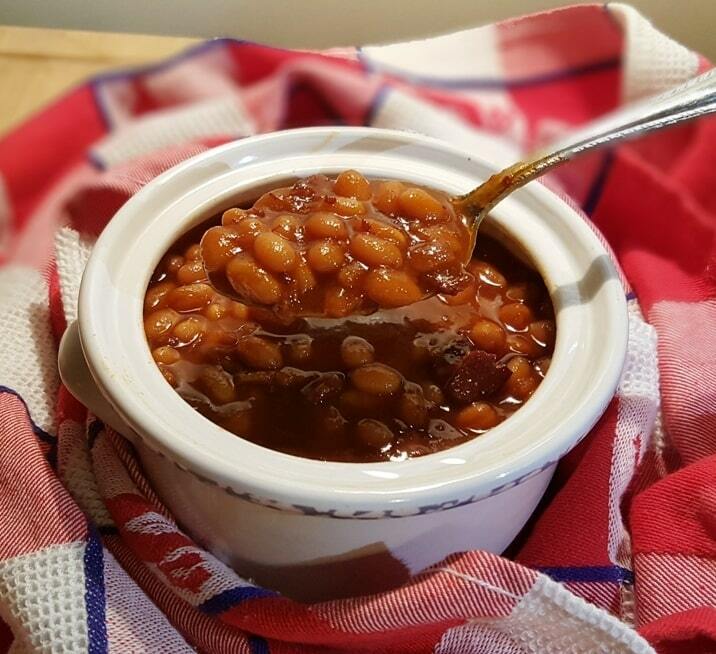 Instant Pot Baked Beans are not only for holidays such as Fourth of July, Labor Day and Memorial Day. They can be enjoyed every day of the ear. Rinse and sort beans, removing any debris. Select the Sauté or Browning function on Pressure Cooker and allow to heat. 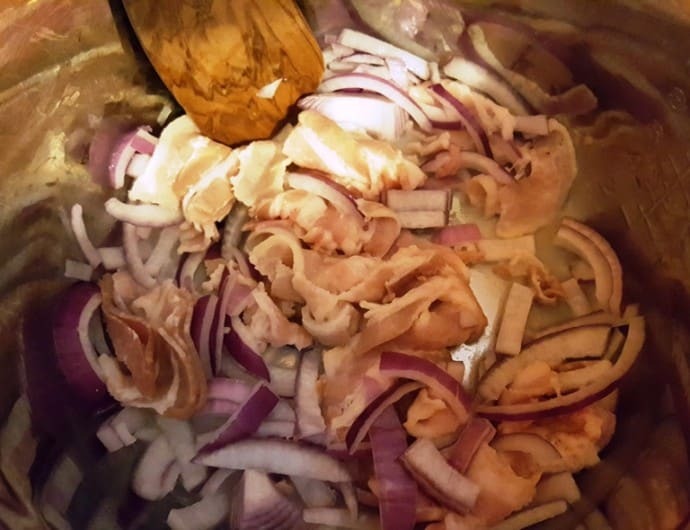 Add bacon and onions to the Pressure Cooker cooking pot and cook until bacon begins to render, scraping brown bits from bottom of cooking pot. 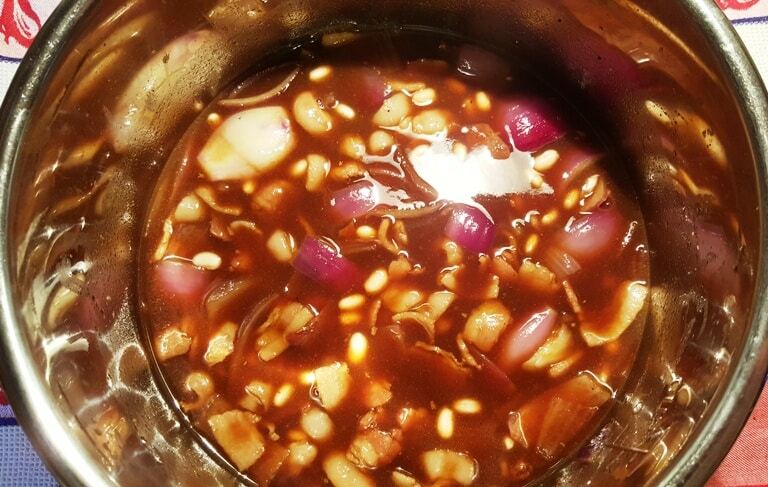 Add 1/4 cup of water and continue cooking until water has evaporated, bacon fat is rendered and onions are semi-soft. Add beans, water, Maple Syrup, Molasses, Ketchup, Brown Sugar, Worcestershire Sauce, Mustard, Pepper to the cooking pot and stir to combine. Lock on lid and close pressure valve. Cook at high pressure for 60 minutes. When beep sounds, wait 10 minutes and then carefully release the rest of the pressure. Add the salt. Taste a couple of beans for tenderness and sweetness and add more Molasses, if a sweeter taste is desired. If Beans are still hard, cook for another 15 minutes. Select the Sauté or Browning function and simmer until desired consistency. Beans will continue to absorb liquid as they cool. Old Beans will remain hard and not absorb water. Make sure to check expiration date. For a dump and push start recipe, add all ingredients to cooking pot and cook for 60 minutes. What Entrees and other Sides Go with Baked Beans? They pair well with my Pressure Cooker Carolina BBQ Spare Ribs. 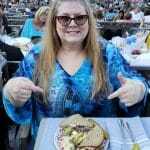 Don't forget the Pressure Cooker Picnic Potato Salad. 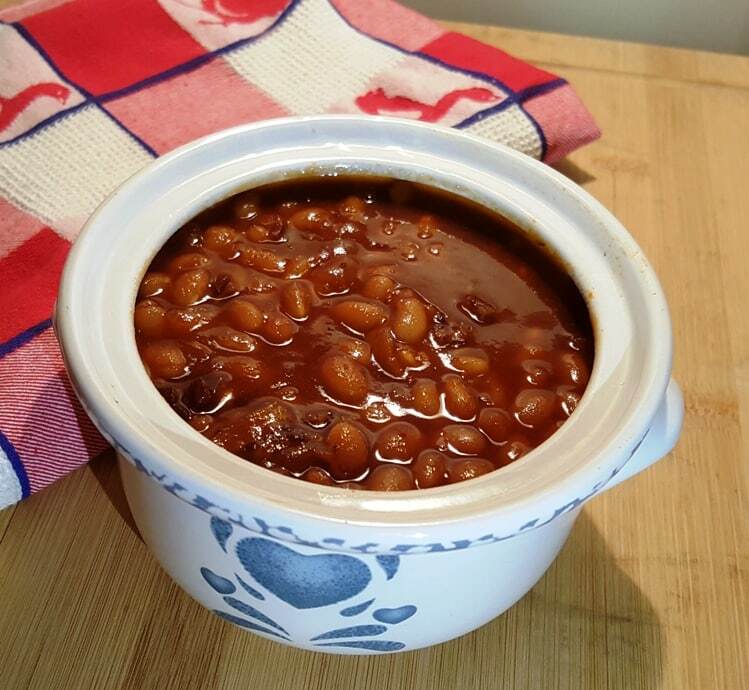 PIN this Instant Pot / Pressure Cooker Holiday Baked Beans! I’m confused on the salt….I see 1T Kosher and then 1/2 Tsp of sea salt??? Which is it when you add salt after cooking?? I am not doing a soak…..is the Kosher salt for that? I made these today, after the hour of cooking, they were still hard. Did another 15, then another 15 and finally another 30 minutes, still not super soft but we ate them anyway. Taste was good, just the beans never really got soft, what could have went wrong? Cindy, I think presoaking your beans will elevate hard beans. I respectfully disagree that beans don’t cook well because they’re old. Once soaked ‘alone’ (BEFORE adding sugars, etc.) they cook beautifully. Since we have the IP, I pressure cooked my beans 10min and did an instant release then followed this recipe (don’t have to soak overnight now). Please see my comments below. We LOVE the recipe. My family loves beans of all kinds and these beans are fantastic! So good. The flavor is spot on. I soak the beans overnight and cut the water in half because I’ve found that using the full amount of water with pre-soaked beans makes them too watery and the additional saute time has a tendency to change the integrity of the beans (makes them too soft). Greatly appreciate the reference to the Reditainer freezer containers. 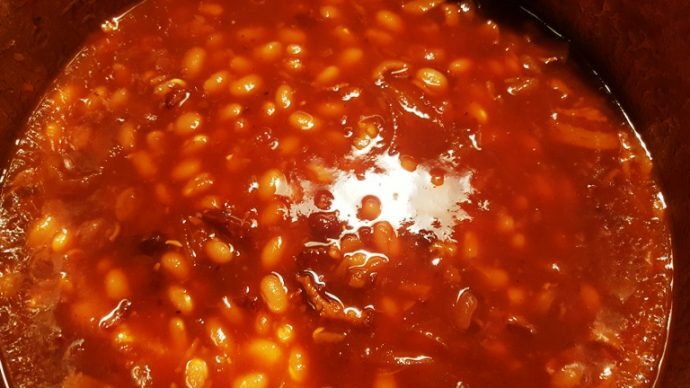 I will be ordering some today to store these amazing baked beans! 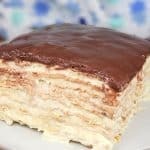 Can you add ham hocks to your receipie and if so how much time adjustment should be made? Any impact to the beans? Your Holiday Baked Beans were fantastic! I found there was way too much liquid in them. I think it’s because I soaked them overnight????? I discarded about 2 cups of liquid after cooking them for 60 minutes. I’ll definitely make them again using less water. Thanks. Can I use canned kidney beans instead? Fantastic flavors! 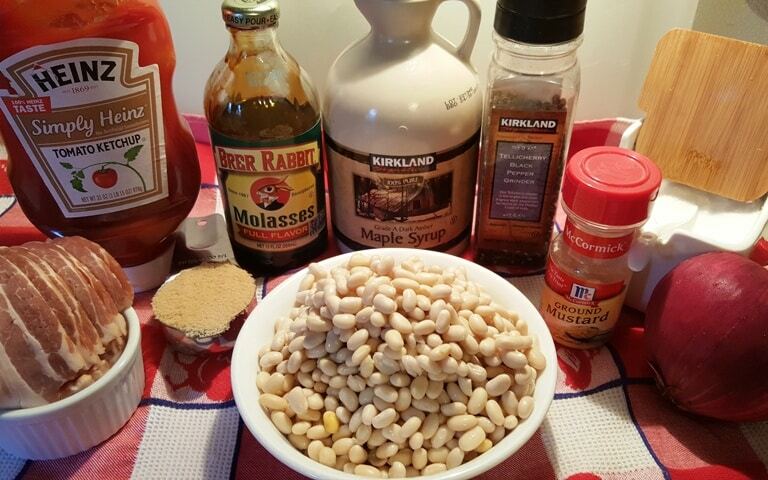 I had some old Great Northern White Beans on hand, used those. My cooking time was about double due to old beans, but the end result was perfect! I haven’t made it yet. But wondering if you could double the recipe with same cook times? I need to share that I would like to very respectfully disagree re: hard beans. I learned years ago from making my first baked beans on the stove that adding the sugars too soon will not allow the beans to soften – ever – no matter how long you cook them. Dry beans are hard, store well, and I don’t believe an expiration date is even necessary thinking they could last a life time if dry . Since that experience, I have ALWAYS presoaked my beans, and all is well. To try my IP, I pressure-cooked my dry beans 10min prior doing an instant release (no need to soak overnight anymore). Then I followed this recipe. GREAT taste! I added 2T smoke and more salt. YUM! I may reduce the water to 3c as we like them super thick. 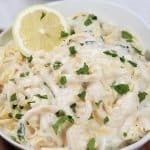 Thank you for your time and talent to make this delicious recipe!